The term IGBT is a semiconductor device and the acronym of the IGBT is insulated gate bipolar transistor. 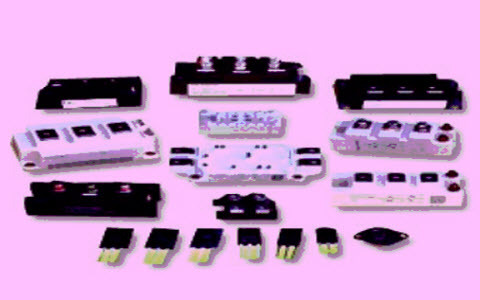 It consists of three terminals with a vast range of bipolar current carrying capacity.The designers of the IGBT think that it is a voltage controlled bipolar device with CMOS input and bipolar output. The design of the IGBT can be done using both devices such as BJT and MOSFET in monolithic form. It combines the best assets of both to achieve the optimal device characteristics. The applications of the insulated gate bipolar transistor include power circuits, pulse width modulation, power electronics, uninterruptible power supply and many more. This device is used to increase the performance, efficiency and reduces the audible noise level. It is also fixed in resonant-mode converter circuits. Optimized insulated gate bipolar transistor is accessible for both low conduction and switching loss. The insulated gate bipolar transistor is a three terminal semiconductor device and these terminals are named as gate, emitter and collector. Emitter and collector terminals of the IGBT are associated with a conductance path & gate terminal is associated with its control. The calculation of amplification is attained by the IGBT is a radio b/n its i/p & o/p signal. For a conventional BJT, the sum of gain is nearly equivalent to the radio to the output current to the input current which is termed as beta. 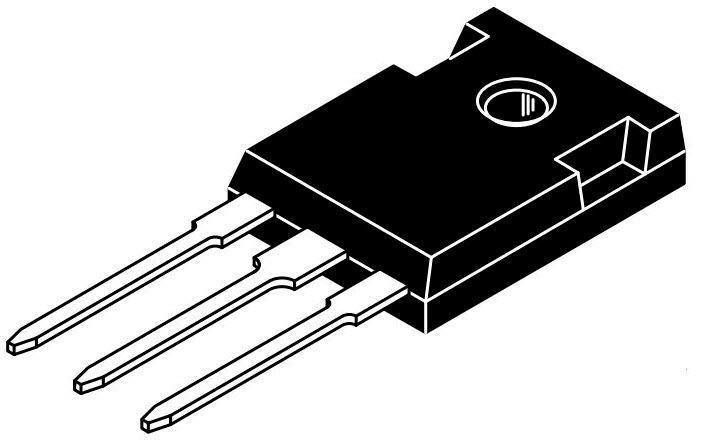 The insulated gate bipolar transistors are mainly used in amplifier circuits such as MOSFETS or BJTs. 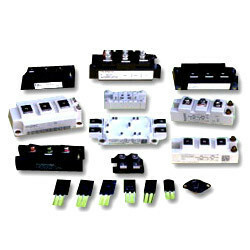 The IGBT is mainly used in small signal amplifier circuits like BJT or MOSFET. When the transistor combines the lower conduction loss of an amplifier circuit, then an ideal solid state switch occurs which is perfect for in many applications of power electronics. An IGBT is simply turned “ON”&”OFF” by activating and deactivating its Gate terminal. A constant voltage +Ve i/p signal across the gate and emitter terminals will maintain the device in active state, while assumption of the input signal will cause it to turn “OFF” similar to BJT or MOSFET. The basic construction of the N-channel IGBT is given below. The structure of this device is plain and the Si section of the IGBT is nearly similar to that of a vertical power of a MOSFET excluding P+ injecting layer. It shares the equal structure of metal oxide semiconductor’s gate & P-wells through N+ source regions. In the following construction the N+ layer consists of four layers and that are situated at the upper is called as the source and the lowest layer is called as a collector or drain. There are two kinds of IGBTS namely, non punch through IGBT (NPT IGBTS) and punch through IGBT (PT IGBTs). These two IGBTs are defined as, when the IGBT is designed with the N+ buffer layer then it is called as PT IGBT, similarly when the IGBT is designed without a N+ buffer layer is called as NPT IGBT. The performance of the IGBT can be increased by existing the buffer layer. The operation of an IGBT is faster than the power BJT and power MOSFET. Based on the basic construction of the insulated gate bipolar transistor, a simple IGBT driver circuit is designed using PNP and NPN Transistors, JFET, OSFET, that is given in the below figure. 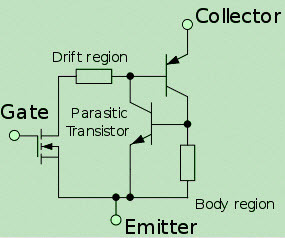 The JFET transistor is used to connect the collector of the NPN transistor to the base of the PNP transistor. These transistors indicate the parasitic thyristor to create a negative feedback loop. The RB resistor indicates the BE terminals of the NPN transistor to confirm that the thyristor doesn’t latch up, that will lead to the IGBT latch up. 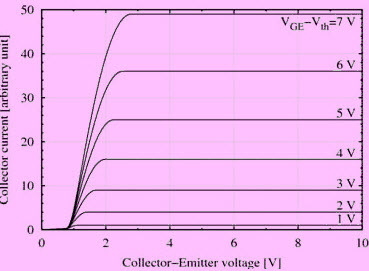 The transistor denotes the structure of current among any two neighboring IGBT cells. It lets the MOSFET and supports most of the voltage. The circuit symbol of the IGBT is shown below, that contains of three terminals namely emitter, gate and collector. Because the IGBT is a voltage-controlled device, it only requires a small voltage on the Gate to maintain conduction through the device not like BJT’s which need that the Base current is always supplied in a plenty enough quantity to keep saturation. IGBT can switch current in the unidirectional that is in the forward direction( Collector to Emitter), whereas MOSFET has bidirectional current switching capacity. Because, it controlled in the forward direction only. 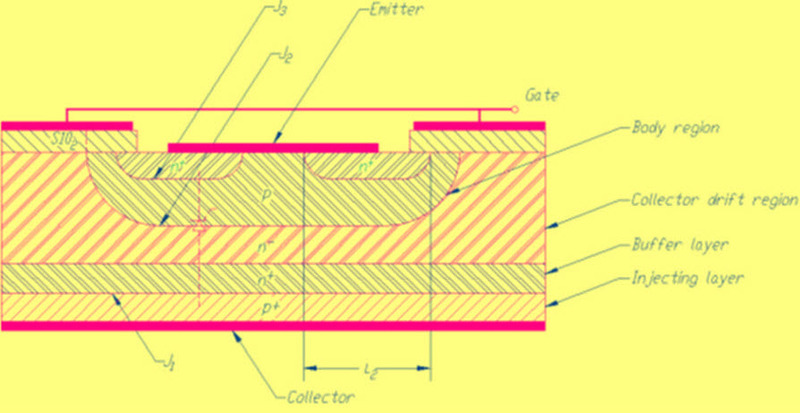 The working principle of gate drive circuits for the IGBT are like a N-channel power MOSFET. The main difference is that the resistance offered by the conducting channel when current supplies through the device in its active state is very small in the IGBT. Because of this, the ratings of the current are higher when compared with a corresponding power MOSFET. Thus, this is all about Insulated Gate Bipolar Transistor working and characteristics. We have noticed that it is a semiconductor switching device that has a controlling capability like a MOSFET and o/p characteristic of a BJT. We hope that you have got a better understanding of this IGBT concept. Furthermore, any queries regarding applications and advantages of an IGBT, please give your suggestions by commenting in the comment section below. Here is a question for you, what is the difference between BJT, IGBT and MOSFET? What circuit / configuration you share on LinkedIn, why there is no EXPLANATION of that circuit ? The said IGBT circuit is for WHAT / HOW will it work / What is expected out of it ? Nothing has been written there ! Can we use IGBT in place of diode in Bridge rectifier circuit ?? As per your query you can not use the IGBT in the place of bridge rectifier, the IGBT will act as a switch and the functions are different for both.